FE 16 CHALLENGE CUP FINAL INNISCARRA 2 - 15, BALLYGARVAN 3 - 7. 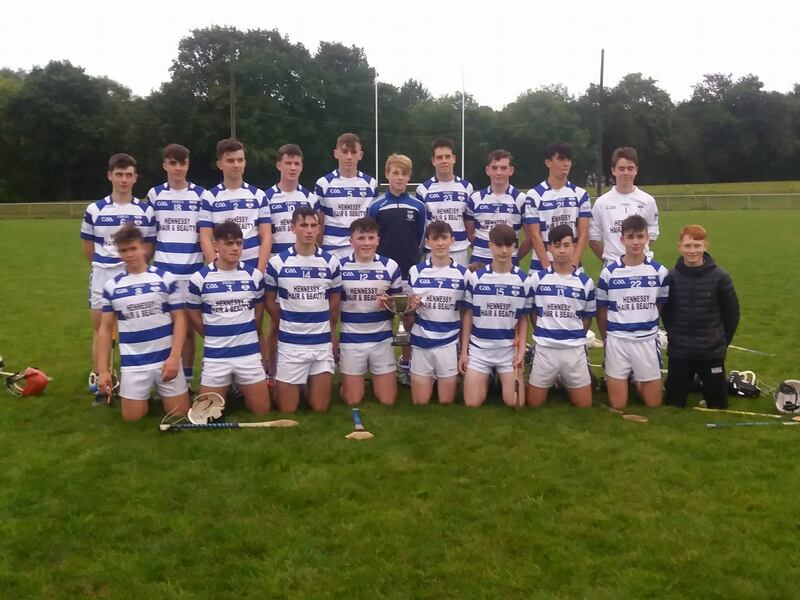 At Carrigaline on Monday evening Inniscarra overcame Ballygarvan to win the Fe-16 Hurling Premier 2 Challenge Cup Final. Inniscarra started very slowly and were a goal and three points down after 10 minutes and looked in trouble but gradually got into the game and scored the next goal and four points to lead by one. Mark Buckley scored the goal, followed by a point after good work by Darragh Murphy and Eric O'Callaghan. Next Sean Sheehan made a wonderful catch from a Ballygarvan puck out and put the ball straight between the posts. Good work by Fergal O'Leary then set up Padraig Holland for a point before Stephen Linehan finished to the net after a good delivery by Jack O'Sullivan. Mark Buckley scored another point and Padraig Holland converted a free, after a foul on Darragh Murphy, to leave the half time score Inniscarra 2 - 5, Ballygarvan 2 - 4. The second half started like the first with Inniscarra slow to get going, conceding the first two points, before excellent work by Peter Sheehan set up Sean Leisk for a point. With ten minutes gone in the second half Inniscarra trailed by a point but then took over and registered ten points in succession, many of them top drawer. Excellent defending by Eoin O'Herlihy got the ball to Colin O'Leary and his pass to Fergal O'Leary set up the first point followed by Jack O'Sullivan pass to Sean Leisk for his second point. Sean Leisk then set up Fergal for another point with Mark Buckley scoring a beauty after a pass from Stephen Linehan. Good defending by Ronan Twomey and David Kiely led to Fergal's third point and a long clearance by Evin Cunningham found Mark Buckley for a point. Peter Sheehan passed to Padraig Holland for a long range point and two further points followed by Stephen Linehan and Mark Buckley after good work by Neil Vaughan. Ballygarvan last score was a consolation goal with time almost up. Final score INNISCARRA 2 - 15, BALLYGARVAN 3 - 7. After the game the Challenge Cup was presented to Inniscarra captain Padraig Holland by Rebel Og representative Bernie O'Mahony. Team, Evin Cunningham, Ronan Twomey, David Kiely, Eoin O'Herlihy, Sean Sheehan, Jack O'Sullivan, Peter Sheehan, Fergal O'Leary, Darragh Murphy, Colin O'Leary, Padraig Holland, Sean Leisk, Stephen Linehan, Mark Buckley, Eric O'Callaghan, Subs, Neil Vaughan for Eric O’Callaghan, David Hoare, Graeme Kelly, Liam O'Connor, John O'Connell, Dylan Colgan, Eoin Dinan, Oisin Morris.